I know I posted only yesterday, but I just now realized that I never made a post about one of the most important birthday cards! My mom’s birthday was in April, and of course I made a card for her, (my dad’s b-day was yesterday, blog post of his card incoming). My mom likes many things, most of which are related to science fiction, books, and Benedict Cumberbatch, but she also likes my art because I am her daughter. I think she is slowly turning her house into the Galleria de Megan, cause she’s awesome! I decided her doodle needed to represent something that she loves, and what’s not to love about Colorado?! 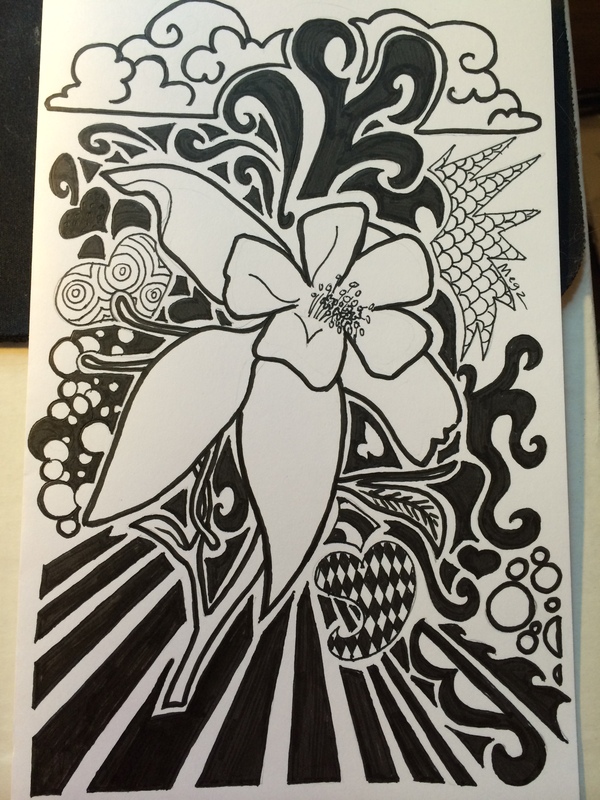 I drew a single Columbine (the state flower of Colorado, also represented here in a previous post) for her birthday card. Maybe next year will be a Doctor Who/Star Trek/Star Wars themed doodle. Black and white is always classy, and will go with any decorations! On a non-drawing related note, the day we move back to Colorado is almost upon us! We are so excited to be closer to my family and to get back into the Colorado Roller Derby scene. Plus, mountains. 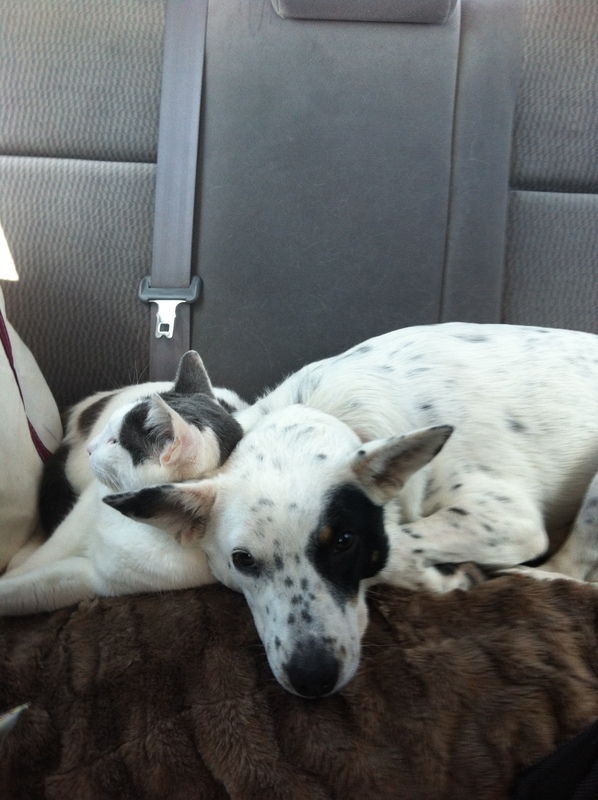 Last summer we drove to visit, and I snapped this photo of Krypto and Tony getting along in the car. There’s nothing like a 24 hour car journey to help the kids get along. UPDATE! This just in! I found the hidden duck! Sometimes, my duck hiding powers are just too awesome. Check every week for new doodles and cute critters! That’s some crazy coral going on and three lonely and inaccurately drawn kelp leaves. Acryllic. About 3″x4″ in size. Painted mainly with a signing brush. I told the original maker of these little flowers that they looked like jewels. I tried to duplicate that. I think I need to do henna sometime. Its great! Don’t Blink. Ever. Because you have no eye lids. 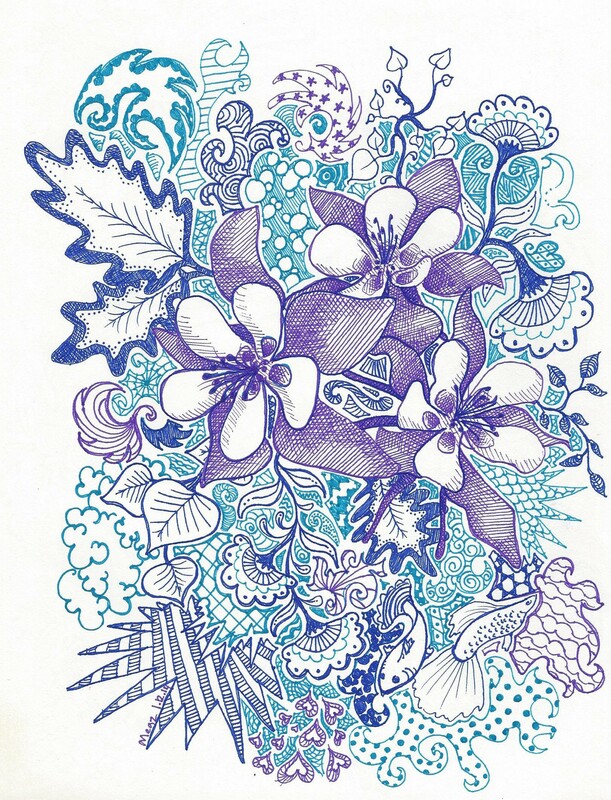 This card was the first I drew and I like how the composition turned out with the use of white. This would be an excellent tattoo. Just sayin’. I declare this a successful improvement. Fluttershy is actually mostly yellow, but itis hard to get any contrast with yellow markers. This is the color of summer…punching you in the teeth! There was this design that I liked, so I made a kind of cruddy copy of it. Sunflower, you rock! Kansas….we forgive you for being kind of boring. There’s a moon and sun, cause you know, twilight. Orange and green automatically mean the seventies. Right? Combination dress clip and hair comb corners. I have mixed feelings about this doodle, but overall, I like it and it didn’t take as long to draw/color. Lacey heart doily is super awesome. Arrows are cool, especially when they are like an octopus. Guess the Gaps! They go quack quack and waddle waddle. Rain and fronds and no outlines. I’m pretty pleased with this. I think I’m getting a little better at composition. Highly stylized tiger and swirls. Gotham skyline, harbor, and bat symbol. Plus some gears cause they are cool. Tried out some new patterns and of course, added paisley. Emprie of the rising Death Star. These colors will punch you in the face! I kept the patterns I used to a minimum for more consistency. Let’s Get the spaghetti party started! Just wind him up and set him loose. All green, all the time. There is something so wonderful about the color green. My artwork and how I create it.